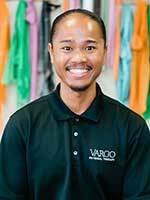 is a Partner and Clinical Director at the Westlake Village Vargo PT clinic. He has been a licensed Physical Therapist since 2004, holds a masters in physical therapy and is a board certified orthopedic certified specialist. Mr. Flores works to combine manual therapy techniques along with exercise to improve patient health and well-being. Mr. Flores received his bachelor’s degree in health sciences as well as his master’s degree in physical therapy from California State University, Northridge. In addition, he is an ASTYM System Certified Clinician and has received additional training in orthopedic manual therapy and orthopedic physical therapy. In 2009 Mr. Flores obtained his Orthopaedic Clinical Specialty (OCS) certification from the American Board of Physical Therapy Specialist. Mr. Flores is also a Certified Strength and Conditioning Specialist (CSCS) through the National Strength and Conditioning Association. Mr. Flores is married and likes to spend time off with his wife and children. When not with them, you can find him at the gym taking part in both weight and cardiovascular training.